Log Cabin Rustics has begun offering a brand new and innovative line of rustic white cedar log furniture. Handcrafted in the USA by the Vermont Cedar Chair Company, these distinctive “bark on” pieces not only have a very revolutionary look, their “suspension seat” design may also be the most comfortable ever. The Vermont Cedar Chair Company’s goal is to create rustic furniture which no one has seen before and erase the line between form and function, while maintaining their dedication to sustainable harvesting methods. Manufactured from 2 rot- and bug-resistant materials – White Cedar and Manila Rope – Vermont Cedar Chair Company furniture is intended to last generations and is covered by a lifetime warranty on materials and workmanship. Their unique suspension seat has been called “..shockingly comfortable..” by customers, and is perfect for indoors or out. 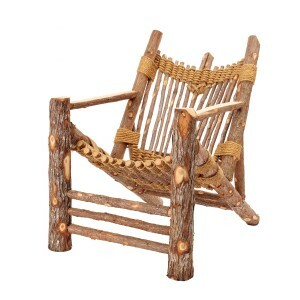 Visit us at Log Cabin Rustics to buy this fine Adirondack chair and other fine pieces of rustic furniture.